Labor activist Kamal al-Fayoumi has lost none of his swagger since being fired from the sprawling Egyptian textile plant where he worked for three decades and was known as an agitator. Striding through a gritty industrial town in the Nile Delta, he proudly points to workers’ clubs, cooperative grocery stores, cinemas, a pool and a hospital — all of which have seen better days — and brushes off threats from management and the police. Hard times in Egypt have spurred an increase in labor unrest, even as President Abdel-Fattah el-Sissi’s government has largely succeeded in quashing political demonstrations over the past two years. Rising prices, low wages and delays in salaries and bonuses have workers vowing more strikes and protests, even at the risk of a violent crackdown. Since last month, workers have held sit-ins at Alexandria’s port and even in Cairo, flouting a 2013 ban on protests decreed after the military overthrew Islamist President Mohammed Morsi. Thousands protested at a total of 493 actions in the first four months of 2016, a 25 percent increase from the same period a year ago, according to Democracy Meter, an Egyptian NGO that tracks and verifies protests using multiple sources. “Labor tried to give el-Sissi a chance. But you can’t take away peoples’ rights and fail to fix poverty simultaneously,” said Mohamed Adel, the director of the group. He said the actions range from work stoppages to peaceful marches and pickets. Security forces have waged a relentless crackdown on dissent since Morsi’s ouster, arresting thousands of his Islamist supporters as well as prominent liberal and secular activists. But while authorities banned a march on International Workers Day last month organized by independent trade unions, they have not targeted labor activists with mass arrests, perhaps fearing a backlash. Former President Hosni Mubarak kept a tight lid on labor unrest during most of his 30 years in power, permitting only state-controlled unions in a tradition dating back to the days of socialist leader Gamal Abdel Nasser. But the independent unions began holding protests in the twilight years of Mubarak’s reign, and workers assumed a major role in the 2011 uprising that ended it. Since then, organized labor has been under intense scrutiny. Earlier this year, an Italian doctoral student who had been writing his thesis about independent unions was found tortured to death. Giulio Regeni disappeared on the Jan. 25 anniversary of the revolt, when security forces were out in force in central Cairo. Police have denied any involvement, but Italy withdrew its ambassador, saying Egypt was not fully cooperating with the investigation. A draft law is in the works that would further delegitimize independent organizing, and a lawsuit filed by the official state union, expected to be decided later this summer, seeks to criminalize non-official trade unions. The government has also renewed efforts to shut down NGOs that receive foreign funding, which could affect unions with links to international labor movements. At the International Labor Organization’s annual conference in Geneva this week, Egyptian Labor Minister Mohamed Saafan gave a speech that made no mention of independent unions, focusing instead on state sovereignty and the fight against poverty. The head of the state union, Mohamed Wahballah, who was also present, described terrorism as the main obstacle to development, according to Egypt’s official news agency, MENA. Independent unions filed a complaint to the body, rejecting Egypt’s delegation at the conference as illegitimate and denouncing what they described as government attempts to “liquidate” them. The ILO said in a report that it was “concerned” about doubts over the official union’s independence, and that Egypt’s delegation was not in accordance with its obligations as a member. Kamal Abbas, head of the independent Center for Trade Union and Workers’ Services, said he expects more strikes, but not the kind of large-scale demonstrations seen during and after the 2011 uprising. “The government is attacking the independent and professional unions, and the workers are standing up, especially in cases where they are dismissed unjustly or benefits are not paid out,” he said. Strikes at the Misr Spinning and Weaving factory in the town of Mahalla el-Kobra occur several times a year and have turned violent in the past. 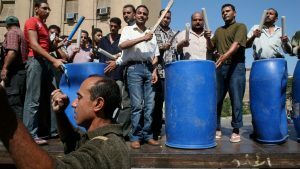 The grievances of its 20,000 workers sparked the first mass protests against Mubarak on April 6, 2008, spawning a youth movement called April 6 that played a key role in the 2011 uprising. The group has since been outlawed and its leaders imprisoned. Around 10,000 of the factory’s workers are associated with the independent unions, al-Fayoumi said, and have long used strikes as their principle means of securing higher wages and benefits. Activists say the workers are also organizing via social media. For many workers, the pain of recent price increases — driven by double-digit inflation — could outweigh the dangers of taking to the streets. “No one can predict the future, but if prices keep rising, and salaries stay the same, the workers will hold peaceful protests until the salaries match the prices,” al-Fayoumi said. On a recent trip outside his old workplace, al-Fayoumi was detained by guards for five hours and questioned at the behest of state security about his activism and possible links to foreign funding. Late last month, security forces broke up a sit-in at a shipyard in Alexandria, Egypt’s second city, arresting 13 workers and engineers, who could face military trials since the facility belongs to the navy. Adel, of Democracy Meter, says they are being held in a military prison on accusations of taking part in unauthorized protests.